We provide pest control for bees, wasps, hornets, and yellow jackets. 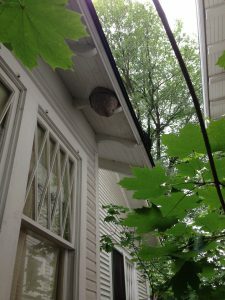 These images are of a Yellow Jacket nest located on an eave before we removed it. This is an especially dangerous nest because of its location. The second image shows the interior layout of the nest. 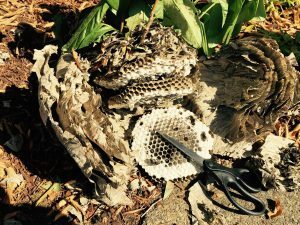 Yellow Jackets can be a big problem for us in Oregon. There are several sub species found here and they all sting repeatedly, unlike honey bees that can only sting once. Yellow jackets often bite humans to test the food source. They will try to take a chunk of your flesh if they are attracted to you. When they are alarmed they bite and hold on, and then stab repeatedly with their stingers. Their nests are dangerous particularly to people or pets with allergies or who swell from minor irritations of the skin. For these individuals, carrying an EpiPen with them is a good idea. Yellow Jackets can nest in the walls of a home, in the ground, and in trees and dense shrubs. If you see lots of bee like insects flying in and out of your eaves or other opening, call us promptly. Yellow Jackets often chew right through the wall board of your interior walls. You can end up with hundreds of ticked off Yellow Jackets in your bedroom. If you suspect a nest in the outside wall, listen for buzzing, and look for a soft spot on the interior wall board. These soft and discolored areas are usually high on the interior wall. Stay out of that room and call us! When you kill a yellow jacket nest in a wall of your home the nest remains containing a big chunk of biomass with sugars and proteins. Other insects will find this food source and may end up inside your home. Carpet beetle infestations are often attracted by and fueled with this biological material. It is often several years after the wasp nest was killed that the secondary pests show up in your home, and nobody makes the connection between the beetles and the nest treated two or three years ago. Nature First can treat the dead or dying nest with boric acid dust or diatomaceous earth dust. This treatment can prevent future problems. All bees are great pollinators, and we depend on them for our food supplies. Thankfully, there has been a rebound in the honey bee populations from the lows of a few years ago, and the farmers are very glad. If you use any bug or weed chemicals around your home, it is extremely important not to get any product on any flowers. ANY member of the bee and wasp family will sting when their nest is disturbed. There are dozens of species of wasp and Yellow Jackets living here in the Northwest. Most of them are rarely noticed by humans. The most commonly noticed wasp around our homes is the paper wasp, and it is very timid, and it wants nothing to do with humans. It is capable of inflicting a nasty sting if it is harassed enough. These paper wasps make nests with open combs. You can see the individual cells. We can spray a least toxic product that will keep them away from your eaves for the season. Bald Face Hornets are the largest and fiercest of the Yellow Jacket family. They have distinctive diagonal, white areas on their heads. They usually nest high in trees in beautiful, big round paper nests. These hornets usually don’t come into contact with humans, unless someone throws a rock and hits the nest. Bald face hornets are very beneficial to our ecosystem. They hunt other insects including Yellow Jackets, mosquitoes, flies, spiders. Nature First will not kill a Bald Face nest unless it is a direct threat to you or your animals. Green Eco-friendly Pest Control using Sustainable, Organic, Natural and Green methods. We safely remove wasps in and around Portland Homes and Businesses.